DIN Time 1.3.1 for Fitbit Ionic is released! DIN Time 1.3.1 has been released! It includes a workaround for Android users who couldn’t use the sliders to set custom colors. It’s not pretty and potentially involves some scrolling, but it should get the job done. Look for “Show alternative Android controls” in the settings! The main new feature though is the new weather panel! Tap the stats panel to switch to: “Feels like” temperature, Wind direction and speed, Atmospheric Pressure, Humidity, Sunrise and Sunset! DIN Time now caches weather data between updates. You should now see less –‘s at startup. Just for fun: A random color theme! Try it, it could turn out great, but odds are that it doesn’t. Sometimes it can be used as a starting point for something better. Removed “Reset colors” in the settings. It’s now in the themes list as “White on Black (default)”. A tiny, but to me important, fix to how the frame around the stats is drawn. DIN Time for Fitbit Ionic now available! 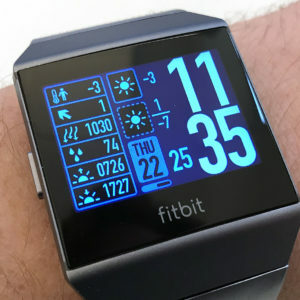 DIN Time was originally created in 2015 for the Pebble Smartwatches and quickly became one of the most popular watch faces on the platform. Now you can enjoy DIN Time in even more colors, on the high resolution screen of the Fitbit Ionic! DIN Time is a clean, glanceable, watch face with layout options for both left and right hand use. This means that the current time will always be the first you see when you pull up your sleeve. Almost everything can be hidden, if you want an extra clean look. Current weather and forecast (in the lower dashed weather box) with expected high and low temperatures for the day. Weather is provided by Yahoo or Dark Sky (requires API key). Temperatures can be shown in Celsius or Fahrenheit. The weather updates every 15 minutes. More features and improvements are planned, which I hope will bring DIN Time for the Ionic closer to the Pebble original. 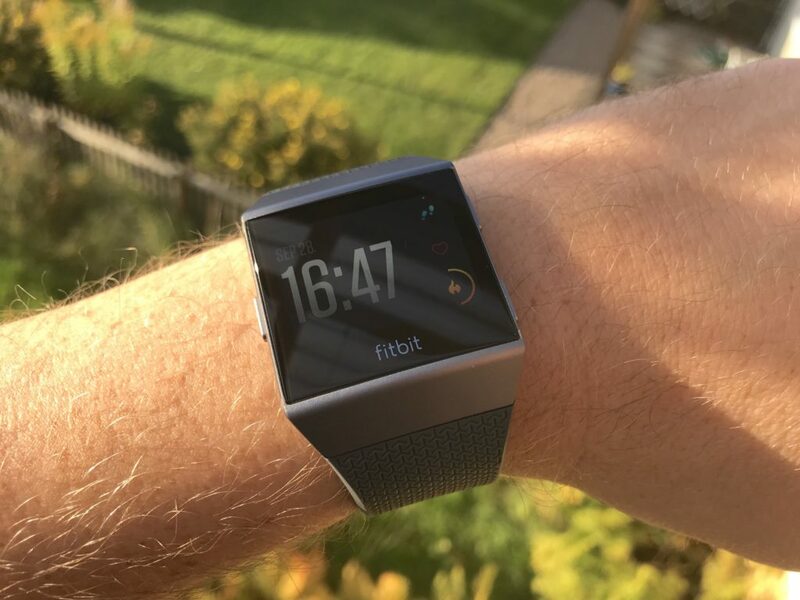 My first watch face, Pulse-R LED, for the Fitbit Ionic is now available in the Fitbit App Gallery. 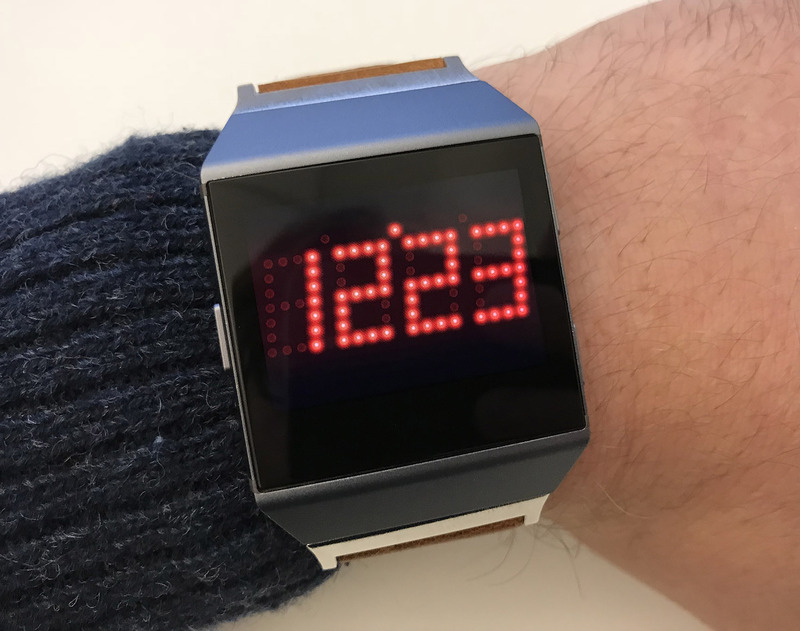 Pulse-R LED is a retro inspired LED watch face that fits the design of the Fitbit Ionic perfectly. Time, with blinking LEDs at the top indicating seconds: leftmost blinking LED for seconds 0-19, middle LED for seconds 20-39 and the rightmost for seconds 40-59. By tapping the left part of the screen (hours) your total steps today will be displayed (indicated by a blinking S), another tap shows current heart-rate (blinking H). The next tap returns you to time display. I will probably add more stats in an update. Tap the right part of the screen (minutes) to display the date in MMDD format. Unlit LEDs in the background and a slight “red glass effect”. Change of how the top LEDs represent seconds, for more detail. If you wonder what ever happened to DIN Time for the Fitbit Ionic all I can say is that it had to wait a bit, but it is up next! Yesterday I received a Fitbit Ionic directly from the good people over at Fitbit! 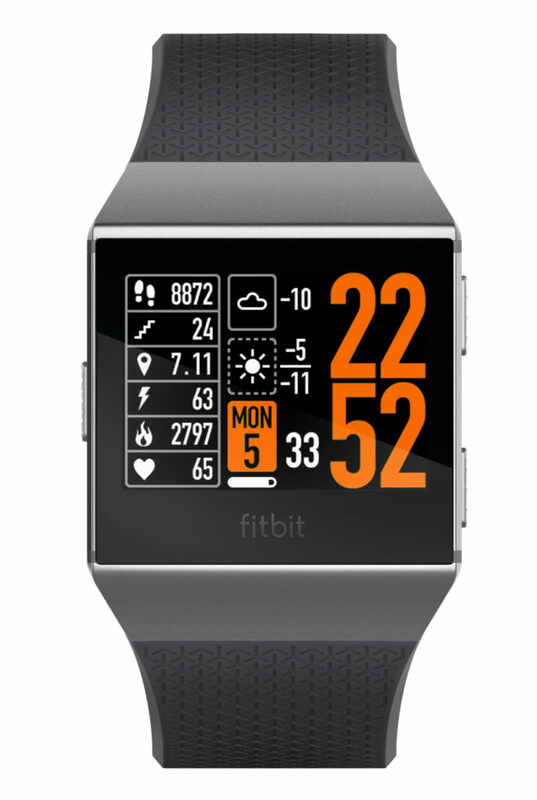 That means I will do my best to bring one of the most loved Pebble watchfaces, DIN Time, to the Fitbit Ionic!